During the late 1800s the Northwest Territories– when it was made up of what is now Nunavut, Yukon, Alberta, Saskatchewan, Manitoba, northern Ontario and northern Quebec – had a fully elected Legislative Assembly. In 1905, with the creation of the provinces of Alberta and Saskatchewan, the NWT Legislature was dissolved and all governance of the territory was turned over to a federally appointed Commissioner. In 1921 an appointed four-member advisory Council, made up of Ottawa-based civil servants, joined the Commissioner. Over many years positions on this Council slowly grew in number but it wasn’t until 1947 that it actually had someone from the north, John McNivan of Yellowknife (map). By 1951 three of the eight Council members were northerners elected to these positions. It wasn’t until 1966 that elected northerners outnumbered appointed southerners on the NWT Council. It was a long road back to responsible government in the Northwest Territories but this was finally achieved in 1975 when all members of the Council were elected. Northerners of Aboriginal descent filled the majority of the seats on this 15-member Council. 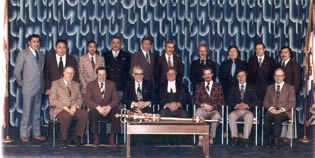 In 1976 the NWT Council became the Legislative Assembly of the Northwest Territories.